Crowdfunding enables established companies to leverage R&D tax credits and expand. In many cases, crowdfunding may be just what is needed to gauge consumer interest in new product development, obtain funding and secure federal and state R&D tax credits at the same time. Crowdfunding websites solicit donations from individuals for fundraising campaigns launched by companies, usually statups, on the crowdfunding website. They use one of two models; the donation model or an equity based model. Sites like Kickstarter and Indiegogo use cash donations in exchange for early access to the product or other perks from the fundraiser. Other sites, like Fundable, offer the fundraiser the option to use an equity based model where the donation leads to equity in the company. Many different industries are participating in crowdfunding and many crowdfunding websites list anywhere from 10 to 25 categories of projects; some examples are film, food, medical/health, technology, education and religion. High levels of funding and donor participation exist for every category. Below are some recent statistics that illustrate the tremendous potential for crowdfunding for companies of any size and many different industries. It should be noted that virtually all of the projects listed below have a technical aspect that would make them excellent candidates for R&D tax credits. They represent a variety of industries and include two 3D printer development projects , two residential "Internet of Things" projects and a mobile medical application. Recently, Marvell Technology Group Ltd, a publicly traded company valued at more than $7 billion, turned to crowdfunding on Indiegogo to test the market and fund development of a new product. Although initially concerned about how potential investors would view a large company's efforts to conduct a small fundraising campaign on the web, they were convinced of the value of doing so. Not only would they receive the funding they wanted, they would also get consumer feedback as contributors "voted with their money" and validated the product concept Marvell was presenting. Another existing company that recently turned to crowdfunding was SparkBase; in existence since 2004. Since that their inception, they have achieved a number of significant milestones including filing for five U.S. patents, expanding to nine countries and winning Tech Company of the Year in 2012 from NEOSA. They successfully raised over $1.3 million from fundable.com. With this new approach, an existing company can use the funding results to achieve both proof of concept and initial order levels along with the funding. They can avoid the traditional business startup process of painstakingly developing a new product and preparing a comprehensive business plan and replace it with a Lean Startup process. This is a particularly good alternative for companies that already have committed budgets or have what they feel are two or more good project ideas but only available budget for a fixed number of those good ideas. It also has the potential advantage of not impacting existing debt covenants and credit line limitations. It should be noted however that existing debt covenants should always be reviewed before commencing a campaign. One other advantage that an existing company may have is that it will typically have the tax capacity to take advantage of the R&D tax credits in the current tax year. Often times, startup companies are in a situation where they still do not have a federal tax liability and therefore must carry forward the R&D tax credit to future years when they do have the tax liability. The following table illustrates potential R&D tax credits that may be obtained. 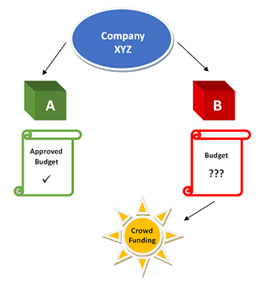 What Are Other Benefits of Crowdfunding? Although this article focuses on the funding and tax credit potential of using crowdfunding, there are many other potential benefits to it as well. It can be a way to judge consumer support for an idea; similar to a focus group. It may be a way to avoid traditional market research in certain instances. A large company may also be able to gauge risk factors; building a pricing and promoting picture as it interacts with contributors. It also is a way for a large company to put a human face on a specific project; interacting again with contributors, creating stakeholders and potentially getting more visibility through social media. Crowdfunding has become a viable method of fundraising for many types of companies in a multitude of industries. Existing companies and even large, publicly traded companies, have used crowdfunding for new projects and as a result may be eligible for federal and state R&D tax credits for the innovation funded by crowdfunding websites. Lynn Bertrand is a Tax Analyst with R&D Tax Savers.